Autumn is the perfect season for families to spend quality time together. 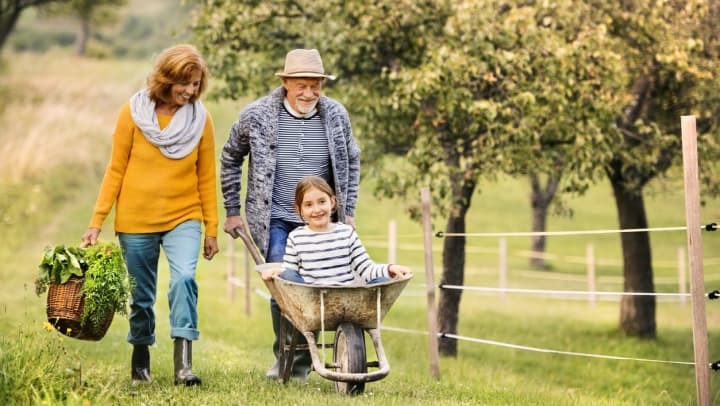 There are many intergenerational fall activities available where adults and children can connect with each other by sharing fun times, learning new skills, and building new memories. Gather the family together and head out to the cider mills. Enjoy friendly conversation during the drive and while at the cider mill. Choose a day when the cider mill has live music or other special events, just to enhance the experience. Visit the Pumpkin Patch Walk around a pumpkin patch and allow each person to select the pumpkin that he or she loves the most. Also peruse the farmer’s market if there is one on the property, and buy gourds, haystacks, and other fall decorations to spruce up the inside and outside of your home for Halloween and Thanksgiving. Make Jack-O-Lanterns The thrill of transforming a pumpkin into a Jack-O-Lantern never gets old. Take it to the next level and turn it into a pumpkin carving contest that everyone in your family can participate in. Just make sure you have plenty of carving tools that are safe for children to use. You can also consider painting the pumpkins to avoid the carving part altogether. Individuals of all ages enjoy sitting around a bonfire while sipping a warm drink, roasting marshmallows, and laughing over old memories or planning new adventures. It’s a perfect opportunity for each family member to reminisce on the past, talk about the present, and discuss plans for the future. Sometimes the most meaningful conversations and memorable moments occur during a long drive. There are plenty of places throughout Michigan, Virginia, and North Carolina where the fall colors are spectacular in late October and throughout November. Be sure to stop and walk around a park or two just to enjoy the fresh air and kick up the leaves. Add an educational aspect to your outing by trying to identify the leaves and trees. Walking through a corn maze gives you the opportunity to spend time outdoors, laugh together every time you hit a dead end, and support your community and local farmers. Line dancing is a wonderful form of exercise, yet doesn’t take a toll on the body as much as some other types of dancing. Each person can learn dancing techniques, improve coordination, and perhaps even experience a different culture depending on the form of line dance. Intergenerational fall activities don’t have to be planned ahead of time. Visiting a loved one at home in the senior living community, for example, can turn into a spontaneous poker tournament or chess match or even simply a long, stimulating conversation. Recent studies have shown that children who spend quality time with adults throughout their childhood tend to be emotionally stronger, and parents and grandparents can provide children with this strength just by being a regular part of their lives. It doesn’t really matter what you do, as long as you spend that time together having meaningful conversations and building memories that can stay with each of you for a lifetime.